Probably one of the most common reports from people who write journals is that the act of putting thought and feelings on paper helps give useful emotional and mental clarity. However, there is scientific evidence that the relief that comes from writing things down is more than just psychological. Dr. James Pennebaker, a researcher in Texas, has conducted studies that show that when people write about emotionally difficult events or feelings for just 20 minutes at a time over three or four days, their immune system functioning increases. Dr. Pennebaker’s studies indicate that the release offered by writing has a direct impact on the body’s capacity to withstand stress and fight off infection and disease. After the publication of the Pennebaker studies, the medical and therapeutic communities began taking a closer look at journal writing as a holistic non-medicinal method for wellness. In 1985, Kathleen Adams, a psychotherapist in Colorado and the founder/director of The Center for Journal Therapy, began teaching journal workshops designed to give the general public tools that could be used for self-discovery, creative expression and life enhancement. 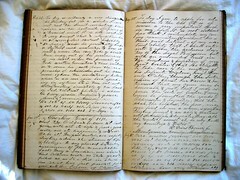 Her “journal toolbox” of writing techniques offered a way to match a specific life issue with a specific writing device to address it. Her first book, Journal to the Self: 22 Paths to Personal Growth was published in 1990. Through a network of Certified Instructors, the Journal to the Self workshop is available throughout the United States, Canada and several foreign countries. Journal therapy is also very effective in groups, and it is common for group members to establish a sense of deep community as writings representing authentic expressions of self are shared.